Some passing clouds. Low 59F. Winds WNW at 5 to 10 mph.. Some passing clouds. Low 59F. Winds WNW at 5 to 10 mph. Two first-year Easter Egg hunters didn't seem exactly sure about the rules for the event on Easter Sunday in 2018 at the Grace Episcopal Church's Easter Egg Hunt. 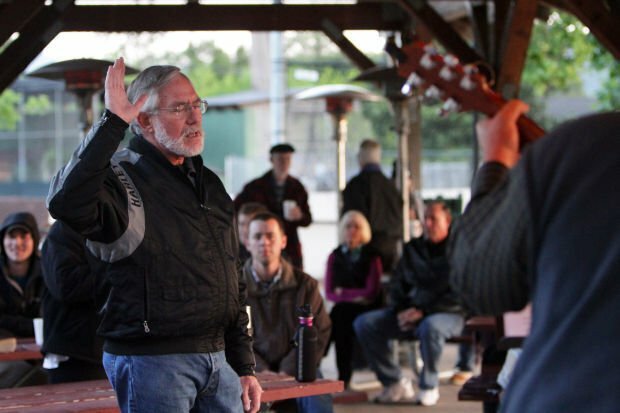 Ron Wicker stands in prayer during Calvary Chapel's annual Easter sunrise service at Crane Park in St. Helena in April 2015. This year's Easter sunrise service will be held at 6:30 a.m., at The White Barn, 2727 Sulphur Springs Road in St. Helena. The beauty and simplicity of St. Luke's Episcopal Church in Calistoga is shown during the Easter Sunday service in 2018. At the altar are the Rev. Deacon Susan Napoliello, the Rev. William "Father Mac" McIlmoyl and Lay Eucharistic Minister Bill Pease, far right. Pianist Terry Winn and cellist Jeffrey McFarland-Johnson will be providing music, along with the St. Helena Methodist Bell Choir, on Easter Sunday at the St. Helena United Methodist Church. Easter Week from Palm Sunday (April 14) to Easter Sunday (April 21) is the holiest week in the Christian calendar, from the triumphant entry of Jesus Christ into Jerusalem, to his death on a cross and resurrection. Upvalley churches have planned a variety of services. will hold its Easter Sunday service at 9:30 a.m. at the American Legion Hall, 1291 Madrona Ave. in St. Helena. A continental breakfast immediately follows the service. Calvary Christian Church will hold its Easter service, 6:30 p.m., Saturday, April 20 at 2322 Spring St., St. Helena. in Napa and St. Helena will begin at 10 a.m., on Sunday, April 21.
will hold its Easter Sunday services at 10:30 a.m. at Pioneer Park in Calistoga. Refreshments will be provided beforehand. 1504 Myrtle St., Calistoga, will celebrate Maundy Thursday, April 18, 5 p.m.; and Easter Sunday, April 21, 10 a.m., with an Easter Egg hunt to follow. Grace Episcopal Church, 1314 Spring St., St. Helena holds the following Holy Week services. Maundy Thursday, April 18, 6 p.m., Maundy Thursday celebrates the love of Jesus for his disciples and the love in our community. It begins with a simple supper (please bring a simple dish or food item to share), footwashing (for those who desire it), and a bilingual Eucharist around the tables in the Newton Room, followed by a procession to the sanctuary for the stripping of the altar. All ages are welcome. Come as you are. Stay as long as you can. Good Friday, April 19: 11:30 a.m., Stations of the Cross, bilingual. Noon, Good Friday Service, Remembering Jesus’ death on the cross through readings, prayer, and communion from the reserved Sacrament. 5 p.m., Good Friday Service in Spanish. 7 p.m., Napa Valley Taizé service on the Labyrinth — Chant, readings, and community labyrinth walk. Holy Saturday, April 20, 8 p.m., Bilingual Easter Vigil. This ancient gathering in vigil and prayer on the night of Christ’s “passing-over” from death to life invites us to experience fire, darkness, chanting, story and song, the water of baptism, and the first joyous proclamation of the Easter Alleluia. Easter Sunday, April 21, 8 and 10 a.m., Celebrate Easter with the Holy Eucharist filled with Alleluias and music. At 11:30 a.m., continue the celebration with an Easter Egg Hunt for kids of all ages. The Presbyterian Church of Saint Helena, 1428 Spring St. will hold the following services this week. Maundy Thursday, April 18: During this service, we will celebrate communion and read scriptures and sing hymns remembering Jesus’ last hours. Worship will be at 7 p.m.
Good Friday, April 19: We have been invited to join the Taize community at the labyrinth at Grace Episcopal for a Good Friday service at 7 p.m., led by Ruthanne Svendsen. Easter Sunday, April 21: One service at our normal 10 a.m. time. Celebrate Christ’s resurrection with us! St. Helena Catholic Church, 1229 Oak Ave., has the following Holy Week services. Saint Helena United Methodist Church, 1310 Adams St. at Oak Avenue, holds the following Holy Week services. Maundy Thursday, April 18, 6 p.m., a simple service of worship, washing of hands or feet and communion. Good Friday, April 19, 3 p.m., Worship with music and prayer in remembrance of Jesus’ passion and death. Easter Sunday, April 21, 6:30 a.m., Sunrise Service at the White Barn, 2727 Sulphur Springs Ave., St. Helena, welcome Easter at the dawn of a new day! 10 a.m., Traditional Easter Worship with Holy Communion and Easter Egg Hunt at the church. Easter musicians are the St. Helena Methodist Bell Choir, Terry Winn and Jeffrey McFarland-Johnson. St. Stephen’s Anglican Church, 1250 Oakville Grade in Rutherford, will hold the following Holy Week services. Maundy Thursday, April 18, 6 p.m., Holy Communion. Celebration of the Last Supper and Institution of the Eucharist; Jesus in the Garden (procession to the altar of repose); stripping of the altar and emptying of the tabernacle. Good Friday, April 19, noon, Good Friday Liturgy, and Mass of the Presanctified, Meditations on the Passion, and the Solemn Collects. Saturday, April 20: Holy Saturday, 6 p.m., Blessing of the new fire and of the Paschal Candle with the singing of the Exultet; Litany of the Saints; and Evensong. Easter Day, Sunday, April 21. 8:30 a.m., Holy Communion, 10:30 a.m., Choral Holy Communion. Celebration of the Resurrection and the New Creation. He is Risen! About 250 kids and 300 parents crowded the grounds outside Farmstead at Long Meadow Ranch on Sunday for the annual Easter egg hunt.